Bob and Lisa Schmeling of Milwaukee, Wisconsin, fell in love with Otto when he was just four months old because of his amazing smile. They weren’t looking to add another dog to their family, but then they brought Otto over for a play date. Otto was looking for a family, and the Schmelings knew right away that this dog was special and that he would be their best buddy for life. “He is well behaved and happy and has the best demeanor. He’s really outgoing and has this huge grin. He peels back his muzzle and shows his teeth and wags really hard when he greets us,” said Lisa. Otto and his pet parents have a special relationship. They train him and travel with him to his competitions. Otto has earned the title of Master Hunter from AKC. 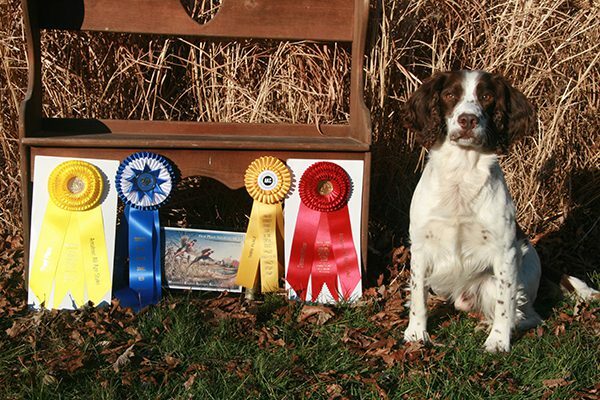 In 2015, when he was 10-years-old, he won an AKC Field Trial for the first time. No doubt there’s something unique about Otto! In July 2016, Bob and Lisa noticed that Otto was straining to defecate. His stool wasn’t normal, and he seemed to be in pain. They took him to their family veterinarian at Park Pet Hospital in Milwaukee, Wisconsin. An X-ray and biopsy revealed that Otto had a cancerous rectal mass. The Schmelings were referred to Lakeshore Veterinary Specialists (LVS) to consult with a surgeon, but a CT scan revealed that the tumor was attached near Otto’s spine. Surgery was unlikely to remove the entire mass, and would need to be followed by 15-20 sessions of conventional radiation therapy to kill any tumor cells left behind. Another treatment option, a new type of radiation therapy called stereotactic radiosurgery (SRS), was also offered to the Schmelings. LVS had recently partnered with PetCure Oncology to bring this revolutionary, more precise form of radiation therapy to pets. SRS could deliver higher doses of radiation to shrink the tumor without any kind of incision in only 1-3 sessions and with fewer side effects than conventional radiation therapy. That meant fewer occurrences under anesthesia and much less risk. For Bob and Lisa, it was the clear choice. Otto received three sessions of SRS from August 9 to August 11, 2016. The Schmelings happily reported that Otto did not have side effects during treatment and did not show signs of any problems. He’s doing better and eating well. “I can definitely see he’s improving more and more, “ Lisa said. Just a couple of months after Otto received SRS, he is already back to competing. This will be his last year doing so, and the Schmelings hope to cap off his award-winning career with an AKC Amateur Field Champion title. You can do it, Otto! 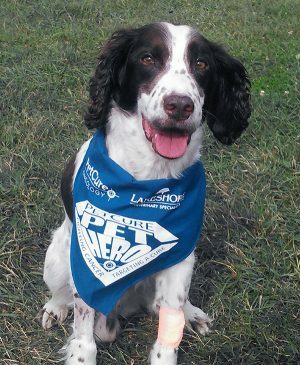 Your fans at PetCure Oncology and Lakeshore Veterinary Specialists wish you the best of luck! Otto stands proud next to his ribbons. Good luck, Otto!